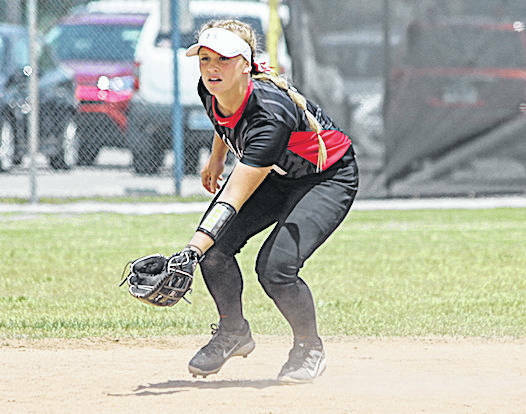 Rio Grande sophomore shortstop Michaela Criner was named to the 2018 National Association of Intercollegiate Athletics Softball All-America First Team after guiding the RedStorm to a 35-win season and a fourth straight trip to the NAIA national tournament. RIO GRANDE, Ohio — University of Rio Grande sophomore shortstop Michaela Criner has been named to the 2018 National Association of Intercollegiate Athletics (NAIA) Softball All-America First Team. The team, which was selected by the NAIA All-America committee, was announced Friday. Criner, who was a second team honoree last season, helped the RedStorm to a 35-win season and a fourth straight trip to the NAIA national tournament. The Bremen, Ohio native, who was also named the River States Conference Player of the Year last month, becomes just the second player in program history to be named a first team All-American. Jenny Olding earned the same honor in 2006. Criner finished with a team-high .534 batting average to go along with 13 home runs and 49 runs batted in. She also had nine doubles, five triples, a .868 slugging percentage and a .565 on-base percentage. Criner led the country in batting average, hits per game (1.938) and total bases per game (3.146). She finished second nationally in total hits (93) and total bases (151), was third in slugging percentage, fourth in runs scored per game (1.208) and 15th in runs scored (58). Criner was the only Rio Grande player to appear on the list. No other player representing a River States Conference school was honored. Senior catcher Harlee Donovan of Southern Oregon was named the NAIA Player of the Year and freshman Emily Cerny of Science & Arts (Okla.) was honored as the NAIA Pitcher of the Year. Donovan was tabbed the 2018 Cascade Conference Player of the Year after batting .447 (80-for-179) with 12 home runs, 77 RBI and a .771 slugging percentage. She ranked No. 2 in the NAIA in RBI and ninth in total bases (138). The native of Half Moon Bay, Calif., led the team with 16 doubles and 62 walks. A native of Newcastle, Okla., Cerny led all NAIA pitchers with 33 wins and ranked third in opponent batting average (.164), strikeouts (298) and total innings pitched (238.0), and seventh in ERA (1.15). She finished her freshman campaign with a 33-4 record and 12 shutouts. Cerny rolled off seven-straight winning decisions to end the year and was named World Series MVP after leading her team to its first-ever national championship. She pitched all of the team’s 30 innings in the event, holding opponents to a .193 batting average against, posted a 1.17 ERA and struck out 27 batters.